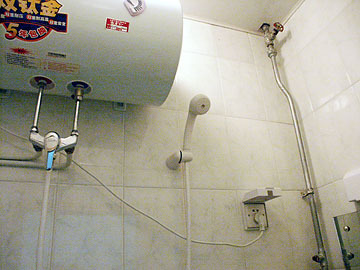 Stumbled across this rather interesting set up for a bathroom shower water heater in China! Notice the convieniently located 10 or 16Amp 220V in-shower socket / electrical outlet!! I just hope they have an RCD! There is a mirror at the right hand side. The outlet make sense there. It also looks like it is well protected from water when the cover is closed. I can't say I'm really bothered by having the hot water cylinder connected to a socket outlet of this type. But a dedicated outlet higher up on the wall would have been far better. If mounted like in the picture, people will be tempted to unplug the cylinder and use the socket for other purposes and forget to close the cover. The trouble only started when someone came up with this idea of putting a shower head next to the outlet! What were they thinking? The cord is going to get wet every day. Not just a little wet - it'll be showered! And people will touch it just as often, directly or with the shower hose. Mechanical damage, anyone? Combined with people unpluging/pluging in the plug, this setup is bound to become dangerous with time. You lift the 'waterproof'(!) flap, with your sopping wet hands, to access the soaking wet shaver socket built into the receptacle, (two-pin, just above the plug). Then you can have a nice clean shave with an electric razor, thoroughly saturated by the shower you just took, while you make breakfast toast with the portable electric grill, fed by that cord, which is just off camera, perched on the edge of the bath, where your kids are having a nice splash with the wife. The prosecution rests its case, your honour! Just wear thick rubber boots while showering and don't touch the walls!! It's not a shaver socket. It looks like the standard Chinese socket outlet: The upper socket is a combination which accepts both American and European plugs and the lower socket is an Australian 10A socket. The 3 pin plug's actually rated 6,10 or 16A. It's based upon, but not 100% identical to the Aus/NZ system. I honestly can't understand why they don't scrap the 220V usage of NEMA though considering there would be no problem with 2-pin \ / plugs. Code or,no code, I would have thought that common sense would suggest that this isn't the greatest idea. Now this says to me "YIKES". People forget with regard to water, human skin resistance drops to incredibly low levels when wet. Although an RCD/GFCI will cut off the current quickly when its trip rating is exceeded, in the time before it trips [generally quoted as 40ms I believe?] that is 2 complete cycles at 50Hz, the current will reach a much higher level than with dry skin. That kind of thing doesn't just scare me, it terrifies me. Like most people on this forum, I have seen what electricity can do at its worst. Most people have had 'a jolt or two' and it 'wasn't so bad' so they don't see what the fuss is all about . They may have got those 'jolts' under less than ideal circumstances from the current's point of view, and the next time won't be so lucky if water is involved. [Steps down off soapbox and quits preaching to the converted]. I was under the impression that in most places in the world, a water cylinder would have to be permanently connected. Even so, that socket-outlet should be on the other side of the cylinder body, away out of the water source. I also see that the flex is draped over the pipework, I just hope that that pipe isn't the hot water pipe it is touching.